Early this summer, riding ocean swells just west of Washington State’s San Juan Island in a whale-watching vessel and scanning the waves for a glimpse of glistening black fins, I found myself in a difficult place. Some chaperone-coordinators and I had brought a group of low-income, “first-generation-to-college” high-school students all the way from north Idaho to see the Southern Resident killer whales, our region’s iconic orca. The students had spent the previous two weeks learning about this unique population of whales in our program’s pilot curriculum, Killer Whales, Salmon & You. From the looks on their faces, our group of youth — many grappling with intensely stressful situations in their lives — obviously felt invested in seeing these whales. 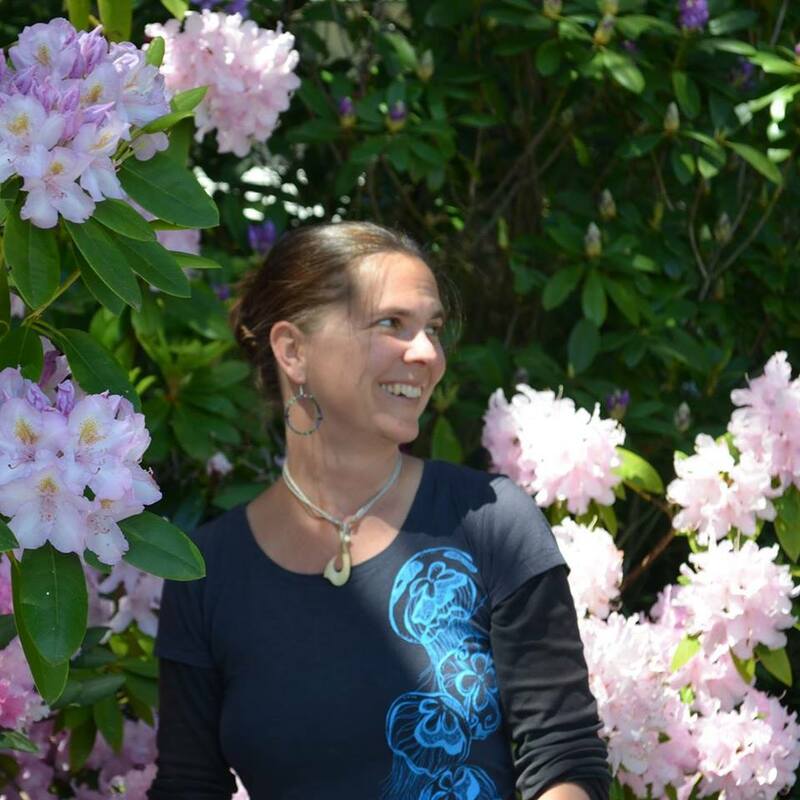 I’d been in cellphone contact that morning with orca biologist Dr. Deborah Giles, who had been hoping to join us to share her expertise with our students. But she was, at that very moment, heading north toward Canada trailing the very whales we’d come to see. 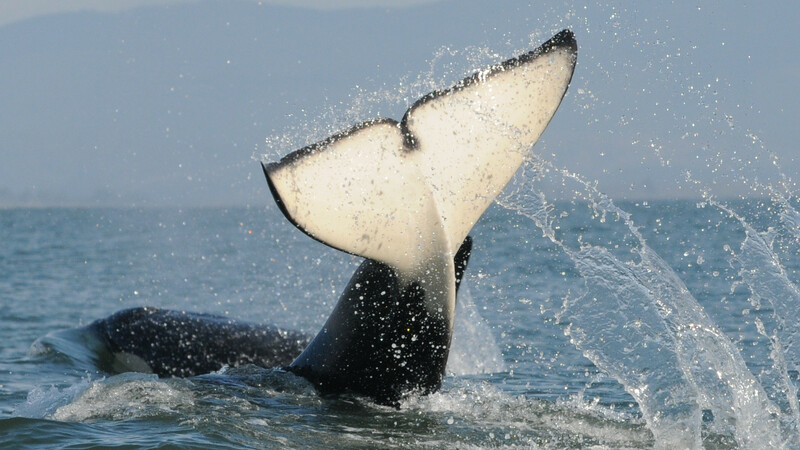 It seemed the whales — known as “residents” because in years past they’d reliably feed in and around the San Juan Islands during summer months — were no longer acting so residential. My alarm bells were clanging. How do you explain to students who’ve already faced so many hardships that they may be witnessing part of an extinction event? Stoically, the two naturalists continued spotlighting the sea lions, eagles and land masses we were privy to. But as the hours wore on, the stark absence of dorsal fins turned into a truth serum. Our students already knew these whales ate almost exclusively Chinook . They also knew that their own backyards — the uplands of rural Idaho — once boomed with salmon. Half our students that day were native Nez Perce, harmed by the same legacy of colonialism that broke the salmon. Both white and native students milled around the ship’s berth, wrapped in blankets. As the day wore on I could see them, one at a time, slowly giving up on what should have been the high point of our trip. Our naturalists explained the dire plight of this beloved population of whales: That the animals are starving; that the grinding impacts of the Pacific Northwest dams have finally brought them to the brink of extinction; and that unless we quickly and radically restore Chinook, the whales will vanish. Someone asked about other threats, like boat noise and traffic and pollution, which they heard has been known to collect in whales’ tissues. “We still definitely need to solve those issues, but without food….” our naturalist trailed off. I wonder how those students felt a few weeks later, during Tahlequah’s tour of grief. Tahlequah, of course, is the now well-known Southern Resident killer whale who dominated the news in July and August as she gave birth and then carried her dead calf for 17 agonizing days. If I had known on that boat that she was nearing the end of her pregnancy, and almost certainly struggling to eat enough to keep her baby healthy, I would have had an even tougher time explaining to our students why we weren’t seeing whales. Just weeks after witnessing my students’ numb resignation out on the water, I and many others felt Tahlequah’s vigil deeply. She refused to let her family sink away, and this has crystallized into what I deeply hope is a worldwide moment of reckoning: Not unlike my indigenous students living with the dark legacy of white colonialism, the whales suffer their own dark legacy at the hands of systemic oppression and injustice. We need to decide whether the orcas will be a grim reminder of our colonialist trajectory of collapse or a standard-bearer of hope for a new era. If it’s the former, we let the rest of these whales die, one by one, until none remain. But if it’s the latter, we intervene immediately with a full battery of restoration measures while also sharing the grim history of how this tragedy came to pass. Because of Tahlequah’s tragic struggle, many more people realize that these whales lost up to half their population to the marine-park industry in the 1960s and early ’70s. In the days before our boat tour, our students not only saw the documentary Blackfish, about this grim history, but also had the opportunity to visit Penn Cove on Whidbey Island, Wash., the place where many Southern Resident killer whales died or were captured. There they met Howard Garrett, founder of Orca Network, who shared not only the gravity of the threats facing these whales, but also told them of the local tribes’ reverent kinship with the creatures — and all they are doing to save them and the salmon they can’t live without. Our students heard several options during an afternoon spent with Dr. Ken Balcomb, the founder and lead scientist of The Center for Whale Research. He’s a whale biologist who has tracked the Southern Residents for more than 40 years, cataloging what is now among the most substantial and respected life-history sets for any mammal. He said much the same thing the students had already learned: We need to address all the dangers to orcas, but without an immediate influx of salmon, they’ll starve. He thinks we might have five years. Balcomb, like Garrett and Dr. Giles, is among the few people who know almost everything about the science and history of these whales — and how to intervene to save them. So what exactly can we do? Balcomb’s talk focused heavily on a proposal to immediately restore wild Chinoook to millions of acres of their original spawning grounds, the rural uplands of Idaho, through a simple action to open channels around the edges of four key lower Snake River dams in eastern Washington. Essentially, cutting through the dirt berms flanking the dams would open up the river while leaving the concrete dam structures in place, at a cost much lower than that of removing the actual dams. Balcomb told us this proposal had been on the table for decades. However, despite its low relative cost, and potential to save millions of dollars for taxpayers faced with the hefty price tag of bolstering the antiquated structures, a lack of political will had prevented action. But that was before a mother whale carried her dead calf for 17 days across 1,000 miles. Have those 17 days of grief finally created an opportunity for change? After our class and field trip many of the students resolved to join the Free the Snake Flotilla, a “kayaktavist”-style event to draw attention to opening the Snake River uplands to salmon recovery. First held in 2015, it will take place again this year from Sept. 7 to Sept. 8 with activist Winona LaDuke as keynote speaker. This year, because of Tahlequah, many more participants are expected. Meanwhile, more than 300,000 people have signed a petition and mailed postcards asking Washington Gov. Jay Inslee and his recently formed Southern Resident Recovery and Task Force to seriously consider breaching the four lower Snake River dams. The task force is expected to develop an action plan for Southern Resident recovery by October 2019. Action is needed by then, if not sooner, because Tahlequah may not be the last Southern Resident to suffer. Scarlet, a three-year-old calf also known as J50, is currently struggling mightily to survive. She’s one of the last young females capable of giving this family of whales a shot at reproductive sustainability and now the unprecedented recipient of an intervention that includes antibiotic doses and live Chinook salmon hand-delivered by the Lummi Nation, who consider her kin. Whatever actions finally come, the truth is that there’s no singular silver bullet to save these whales. There are salmon and habitat to restore, dams to breach, PCBs and pollution to cleanse, boat traffic and noise pollution to curtail to curtail and pipelines to stop — like the Trans Mountain pipeline in Canada was blocked last week, in no small part because of how it would have affected Southern Residents. There’s also climate change to solve, indigenous wisdom to adopt, and most of all, the simple, dedicated work of coming together as allies, partners and kindred spirits to do what needs to be done — for Tahlequah and for all our children. 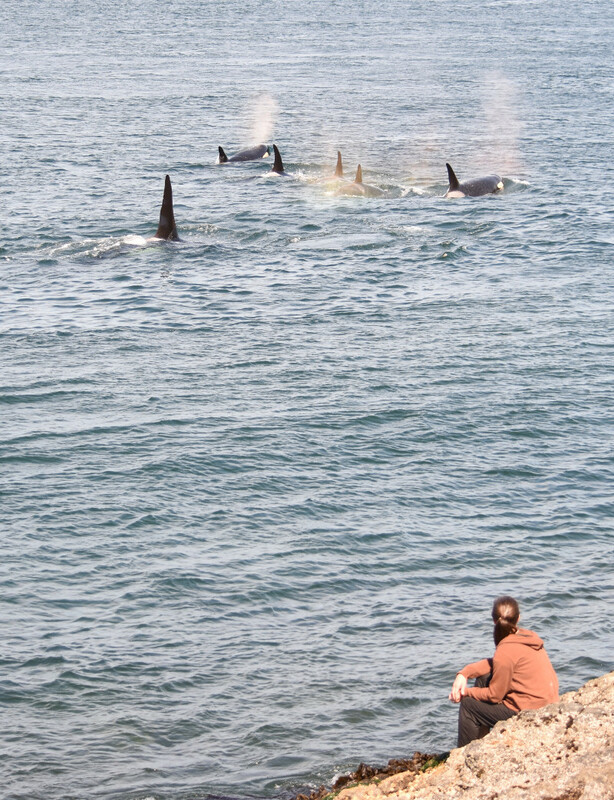 Rachel Clark watches Southern Resident killer whales. Photo: Avery Caudill. Used with permission. © 2018 Rachel Clark. All rights reserved.